Explorez trois villes historiques avec un guide privé lors d’une excursion à la journée de Melk, Hallstatt et de Salzbourg au départ de Vienne. Profitez de la possibilité de personnaliser votre journée selon vos intérêts lors d’une visite de ka pittoresque région des lacs de l’ouest de l’Autriche. Visitez une abbaye bénédictine et des villages pittoresques, et apprenez-en plus sur la région et les traditions culinaires et l’histoire ancienne. Suivez les traces du patrimoine culturel de l’Autriche à travers les rues historiques de Salzbourg : visitez le lieu de naissance de Wolfgang Mozart, une forteresse XIe siècle à flanc de colline, et parcourez un célèbre quartier commerçant avant de retourner à Vienne. Horrible service and a rip off!!!!! I have booked a total of 7 tours with Viator this year and this one was the worst we have ever had. The tour has great potential and the scenery is amazing, but the Tour Supplier needs to be changed if Viator does not want to loose costumers. We did not take the tour option because I considered to be expensive. That was the mistake! THIS IS NOT A PRIVATE TOUR! it is just a taxi service, but not even that. Upon our departure, I informed the driver that I wanted to spend more time in Salzburg since it was stated under the tour highlights. Peter, our driver, asked me if I had the tour option included so my answer was not. So, we spent more time in Hallstatt than needed, later to learn our driver usually has lunch with this buddies here. We only spent less than an hour in Salzburg. We didn't have time to visit Mozart's house and he didn't even told us about it. In other words, if you pay extra for the tour then you will have time to enjoy Salzburg. I have complained to Viator, but the tour supplier Randon Travel assures Peter is his best driver even though, I have provided actual evidence with times stated, I have been ignored. I am still fighting this case and seeking reimbursement. Be careful!!! An amazing tour....Hallstatt has breathtaking scenery! Should be on everyone 's bucket list and things to do in Austria. Salzburg also has its own charm and managed to visit some of the places from Sound of Music. Last but not least, want to thank our driver, Peter. He was really nice and helpful!! Our driver Rado was too good and despite the long drive and tight time schedule, he managed it exceedingly well. This trip can only be enjoyed during summer when days are long. I had the pleasure of going on another Viator trip to Budapest and with another free day decided to take a trip West towards Salzburg! I can't say enough things about the breathtaking views, the unique tour provided based on the things I wanted to see, the excellent driving provided by Peter and the over the top tour provided by Michaela once I arrived in Salzburg. 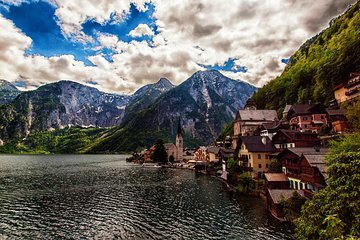 The mountains of Hallstatt are things you only dream about or see in pictures, and they are brought to life as you walk the lakes edge. This was a day packed full of amazing things and more adventure than I could have ever expected, it was totally worth it and I look forward to another adventure with them soon! It was a cold and rainy day. We could not walked outdoors too much. However, the Melk Abbey would have been a great place to walk outside. Hallstatt was a beautiful little town. Good choice of the places along the route from Vienna to Salzburg. Our driver was very flexible and when we told him that my father was having trouble walking that day, he offered to change the itinerary and we took a tour of Melk, Hallstatt and the surrounding lake country instead. It was awesome!